The Hindu scriptures are classified into two: Shruti and Smriti. Shruti means that which is heard. This refers to the Vedas which form the earliest record of the Hindu scriptures. 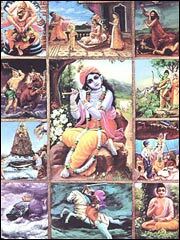 There are four Vedas called Rig, Sama, Yajur and Atharva. Hindu texts other than the Shrutis are known as the Smritis. Smritis contains Itihasa or the epics. The the two great epics are The Ramayana and the Mahabharata. Mahabharata inturn contains the sacred Bhagawad Gita. Other than thess, there are the Puranas and Upanishads. The below list of names are compiled from all these sources.